I guess I should make something for this month. I'll check my box. Maybe I can piece together something cool. I finally found time to take pics of Dav'sa Arman in mandalorian armour. I made a custom for the "self-customs challenge" a while back dressed as a journeyman protector. 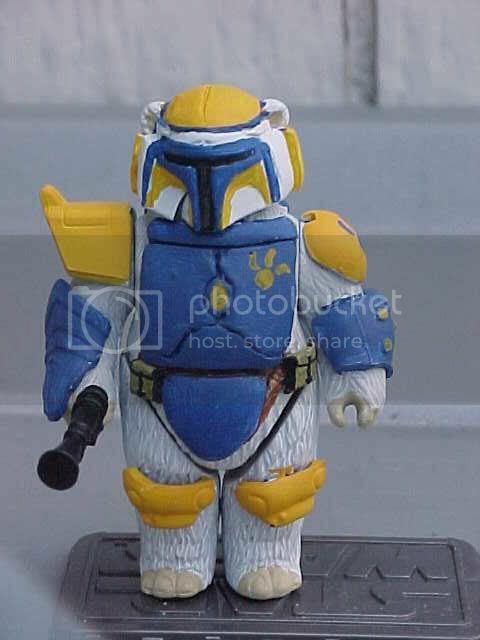 Here he is wearing his mandalorian armour. He served yet again with the mandalorians in the clone wars from Separatist employers, working covert-ops missions with Headhunter company, a section of mandalorians who were once under jaster mereel's direct command. I feel pretty satisfied with it, but I really think I should have painted his jumpsuit greyish-tan then given him a wash of black. Maybe I'll revise it later, but I'm actually quite satisfied with it as is. I need to better my photography skills, cause you can't see the scratches and battle damage I pained on his armour. My favourite is a "paint scratch" scar going down the right side of his helmet. I'll take a pic of that later. Wow, now that is one TOUGH looking warrior. I think the jumpsuit looks pretty good as is. Did you paint it black, then do a gray wash on it? Maybe a bit of dry brushing on it too, first with black, then with gray to see what that might look like. Not that it needs it, just an idea. The green armor is a good match for the overall look of the figure too. Just a bit over a week left for this one guys. Have we settled on what December's challenge will be? I made this one tonight with this challenge in mind. His name is Trisek - he isn't really a "troop" but has done fighting for the Separatists, and secretly has ties to the Badoo Corba terror organization. OK, here's my entry. He's a Nautolan Separatist spy. I envision him using the same abilities that make Kit a good Jedi to be a good spy. Treachery, deception, etc. He's made using Dirk Pitt's sidekick from the Sahara subline (available at Wal-Mart) and a surgically modified AOTC Kit (I cut the action tentacles off, and removed the factory neck to give him a better jaw line). I also gave him Neimoidian boots, which made him taller and added articulated ankles. Compared to the ROTS Kit, he's a tower of an alien. I think he looks dirty and mean, and he's the first guy I've made that was actually inspired by a Custom Challenge, so here you go. In Rem: I commented more in your thread but I really like your entry. The modifications are excellent. CHEWIE: As always an excellent entry. That Djas Puhr body is excellent. I like the purplish skin tone. I'm not sure I like the red leggings though. The red on the collar is fine but for some reason the red seems out of place on the leggings because the pants are that blueish color. I think that I'd either nix the red, or change the pants to black. All of the latest entries have been added. In Rem do you have a finished picture of your neimoidian for me to add? In Rem do you have a finished picture of your neimoidian for me to add? Hmmm... I don't think so. I'll try to snap a couple tonight. Man I wish I could find some of those Sahara figures. I've looked and looked, but no luck at any Walmarts in my area. I love how you put this figure together. He really has that dirty Separatist look to him, and I think the scar is the perfect touch. Great color choice too. Thanks, CHEWIE. I think the pictures turned out OK, but he looks better in person. He also looks good alongside standard figures...I should have taken some photos in context. I think in scale he's probably like 6' 8" or something like that... real tall and lanky, which for some reason adds to his thuggish look. I snagged the only two Sahara guys I saw the last time I was at Wal-Mart (although I have seen more at times when I didn't have $$$ for fodder). They are mixed in with the newer Marine figures, so you might have to dig. Some people are bashing these as shoddy, but mine have both worked out really well so far. Im digging that Nautolean, and the Aqualish is sweet too. I havent had tome to finish mine yet but Im hoping to put some final touches on him tomorrow. I can check my local walmart for you Chewie. I beleive there was one of each there yesterday. Ennis, you mean of Sahara figures? Yeah, if you want to pick me up a couple I will definitely pay you back for sure.